Get a head start on your summer fun with free admission to Theodore Roosevelt National Park on Saturday, June 9. In celebration of National Get Outdoors Day, all 397 national park units, including Theodore Roosevelt National Park, will waive entrance fees. “Outdoor physical activity is an essential part of a healthy lifestyle and Theodore Roosevelt National Park is a great place to get out and enjoy hiking and other outdoor activities,” said Superintendent Valerie Naylor. 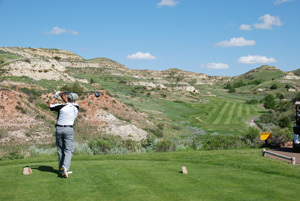 Theodore Roosevelt National Park will offer a variety of ranger led programs throughout the day. National Get Outdoors Day, now in its fifth year, encourages Americans, especially youth, to participate in outdoor activities while enjoying the beauty of public lands such as national parks, forests, and wildlife refuges. Hundreds of organizations and businesses throughout the country will partner with federal, state, and local agencies to provide fun and healthy events at sites throughout the country. President Barack Obama has proclaimed the month of June as Great Outdoors Month and encourages all Americans to share in the natural splendor which belongs to all of us. Theodore Roosevelt National Park will waive its $10 entrance fee on four more days in 2012: September 29 (National Public Lands Day) and November 10 through 12 (Veterans Day weekend). If you are planning a trip that includes multiple national parks, you might consider the $80 annual pass that provides entrance to all national parks, national wildlife refuges, national forests, and many other Federal lands – more than 2,000 in all. This “America the Beautiful National Parks and Federal Recreational Lands Pass” is also offered free to all active duty military members and their dependents. Information on these and other pass options is available the park’s website at www.nps.gov. Theodore Roosevelt National Park also offers an annual pass for $20.